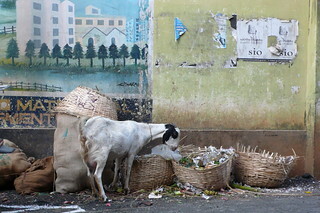 Just opposite the fruit stand was a pile of garbage that the goats would pretty much take care of. I'm sot sure if they had any kind of official garbage collection or not, but it didn't seem so. The goats here would take care of most of the food waste, while the residents burnt most everything else (including LOTS of plastic) in their yards. Everywhere we went in south India there wafted a particularly horrid cloud of burning plastic smoke.